A packed room of executives, entrepreneurs, and people in career transition came together in a fast moving interactive program full of questions and group learning and laughter. We had mothers, sisters, colleagues, friends, neighbors, bosses ask what they could do differently to be heard and understood in busy times - at work and in their family life -and not get thrown off track when we encounter a difficult person or situation. They learned Power of Pause practices to give people the benefit of the doubt and keep themselves from reacting when the unexpected happens in the midst of their busy day. WEST PALM BEACH, FL – October 7, 2009 – Emmy award winning author and motivational speaker Nance Guilmartin presented different communication intelligence tools and decision-making practices during the October 7 launch of GoLead Luminaries, an executive Leadership program offered by Nonprofits First® of Boynton Beach. As one of the nation’s top motivational speakers for a wide variety of groups and industries, Guilmartin has seen first-hand how making rushed up decisions in a 24-7 world has cut productivity and darkened the communications in the workplace. Guilmartin offered proven methods to make savvier choices and avoid mistakes when short-on-time, attention, or temper. She interacted with the participants of the GoLead Luminaries program by directly addressing issues related to the challenge of internal and external communications, including the lost art of listening that can result in a generally tense, unpleasant work environment. Presented financial leaders with advanced communications tools to increase their influence and their return on high risk, high performance conversations during times of uncertainty and change in an increasingly competitive marketplace. The Financial Analysts Seminar is one of the most comprehensive professional development programs for investment professionals from around the world. This advanced interactive sales seminar sharpens the skills of current and future rainmakers and their teams. The training gives sales and service professionals new ways to acquire and retain clients in an increasingly competitive marketplace. The program helps a company gain competitive advantage by having skilled employees who can thoughtfully and quickly discern the unspoken needs and wants of clients and then translate that into a better, more profitable deal and client relationship. Launched Women on the Move®, Florida International University’s new leadership development program for top women executives. Nance developed and co-facilitated this 3.5 day program with FIU Business School Dean, Joyce Elam. For information on the upcoming May or Fall programs please visit: www.womenleaders.fiu.edu. Interactive presentation to over 500 members of this professional organization. They explored what it takes in today's busy world to "cultivate listening" and how to thoughtfully get beneath the surface of someone's words to truly understand their meaning. Ohio University Leadership Retreat. Leadership design and facilitation for Ohio University Foundation's Executive Board. Working with this organization to help them design and execute strategies to meet their short and long-range goals of national prominence. "I'm especially appreciative of your role in hosting and moderating our National PE4life Summit we hosted in Washington DC in 2004. You were terrific in enhancing the work of our speakers, tying the various elements of the event together and activating the participants to take action. You have a wonderful ability to listen and understand points of view from multiple audiences." During several retreats for managers and teams, senior executives of Whole Foods Markets learned how advanced communication skills can help them manage their extraordinary growth. Companies and nonprofit organizations ask Nance to give their clients and donors a memorable experience that enables them to handle whatever life sends their way in today’s times. She spoke at several appreciation events – VIP breakfasts, lunches or dinners - where participants shared their own experiences. They also learned practical communication skills to help them with the potentially awkward or poignant conversations when dealing with professional or family dilemmas, health, wealth, retirement, loss, care giving or simply the changes that affect everyone sooner or later in life today. 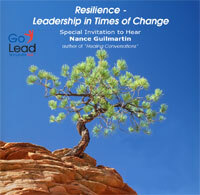 Participants received copies of Nance’s book as a gift and resource to share with their family. The National Parkinson Foundation asked Nance to empower their 350 participants with communication tools that would enable them to apply lessons learned at their annual conference for young onset patients and caregivers. "The two Healing Conversations presentations you tailored to our unique specialty hospital and culture really impacted over 100 staff who attended. As we treat chronically ill children, we are consistently dealing with difficult family, life, and personal situations. Your inspirational book and words were so helpful and comforting to so many staff." Humanistic Medicine, Self-Care And the Art of Life Well-Practiced, Society for Humanism in Medicine's 35th annual conference. Facilitated and co-designed the content and framework for this week long gathering. Medical professionals and their families explored how to work and live at a time when the profession is coping with burnout, stress and change. Third appearance at this conference. ...to support Multiple Sclerosis Patients and Caregivers. Emcee/speaker for over 50 programs reaching several thousand patients and caregivers in Chicago, Minneapolis, Boston, Miami, Jacksonville, Atlanta, Tampa, Washington, New York, Denver, St. Louis, Kansas City, Buffalo, Orlando, Nashville, and other cities. Serono and Pfizer Pharmaceutical companies sponsored the events. Grand Rounds and continuing education credit programs for hospitals around the country including: Baptist Health South Florida; Covenant Health, Milwaukee; Sylvester Cancer Center, Miami; Barrow Neurological Center, Phoenix; Froedtert Medical College, Milwaukee; University of San Francisco; Texas Scottish Rite Children's Hospital; and Fletcher Allen Hospital, Vermont. Over 2500 people have attended healing conversations communications workshops at three Women's Wellness days sponsored by local hospitals. Baptist Hospital in Miami, Dartmouth-Hitchcock in New Hampshire and the Women's Well Being Day at Covenant Healthcare in Milwaukee. Audiences asked great questions and came prepared to learn something they could use right away with family, friends and coworkers. Many wondered what they could have done differently to handle a tough conversation. Others asked how they could talk with someone they cared about but had been concerned about saying the wrong thing. "You were a hit to members of the community as one of our keynote speakers at our annual Women's Health day. Regardless of the audience, your presentation positively touched many lives here in South Florida." Over 100 members of a Wisconsin based philanthropic organization participated in a keynote presentation about the power of listening to be a healing tool. Women Connected also sold books to raise funds to support the efforts of Waukesha Memorial Hospital. Keynote presentation to launch a special month of educating residents about ways to treat, diagnose, and prevent breast cancer. Nance offered audience advanced skills in how to live with a cancer diagnosis, how to support friends going through cancer treatments, and how caregivers can acknowledges their own needs, too. As faculty-in-residence for Harmony Hill, a holistic wellness center, Nance spent a week (through workshops, community programs, and special events) raising funds and awareness for their services. The center provides assistance to those challenged by life-threatening or chronic disease and serves patients, family members, and healing professionals. The Hospice sponsored an evening on healing conversations, offering families the opportunity to learn how to deal with the inevitably poignant and sensitive topics they face as loved ones are very sick, living the last days or weeks of their life, or have died. A recent community tragedy involving the death of a teenager made the evening especially timely in allowing participants to seek help in what to say and how to be in the aftermath of a very public loss. Presented keynotes and interactive workshops on communication and conflict resolution two years in a row. These conferences offered medical professionals intensive opportunities to explore difficult issues. AMA certified Nance's programs for continuing education credits in communication. It's always a treat for Nance to speak to Rotary Club members and learn about their community service projects. Members heard how applying the Healing Conversations principles of listening can make a difference in business and in community service. Nance has spoken to several Rotary clubs in other cities and welcomes the opportunity to support their work. Marquand Chapel 'guest sermon' on The Sacred Art of Listening. Nance was asked to provide both a sermon and a workshop to contribute new insights for seminary graduate students into how to have healing conversations and open minded discourse, especially at times when congregants or peers disagree on issues. Speaker and moderator. Co-sponsored by AACR, the world's leading cancer research and education organization, and by Brown Brothers, this seminar will help estate planners and wealth managers better understand the research legacy opportunities available in collaborating with the American Association of Cancer Research. The Art of Conversation: Listen and Be Heard in Today's World. Nance developed and taught a semester course for Tufts University students to strengthen their awareness of what blocks their (and others') ability to communicate. They also learned how to engage in civil discourse by learning how to create a listening for their speaking by first cultivating a capacity to truly understand what someone else said and meant. Adat Shalom Synagogue in Detroit asked Nance to deliver the 2nd annual I Dr. Fred Benderoff Memorial Healing Lecture. The evening was an opportunity to raise the "consciousness of spiritual healing and strength in combating illness and difficult times." More than 200 attended the interactive learning session on the healing power of listening in action and why it's important to have seemingly awkward conversations with those you care for.before it's too late. Note: Other synagogues have asked Nance to provide workshops on difficult conversations, listening skills and lay counseling insights. Over 100 members of Skillman Church of Christ in Dallas came out on a freezing cold night to actively participate in learning how to support one another when faced with a personal or family crisis. What to say in awkward moments and how to be with another's pain were among the topics covered. Note: Several church book clubs and women's fellowship groups have asked Nance to lead them in exploring how to provide or ask for support during difficult times. Residents of Alexian Village in Milwaukee and Firlane in Union, WA peppered Nance with questions about dealing with their grandchildren and their children's dilemmas such as when a son-in-law loses his job or a child is diagnosed with an illness. 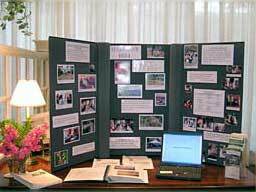 They also wanted better ways to respond when a fellow resident has a loss or endures chronic pain. They shared stories of what they wished people had said to them during difficult times in their lives, especially when coping with losing a spouse, their need for independence and feeling valued.